Degree in Law from the University of Chile in 1960, Doctor in Economy from Duke University in North Carolina (U.S.A.) in 1966. Ricardo Lagos worked as a Professor of Economy in the School of Law at the University of Chile until 1972. Between 1971 and 1972, he occupied the position of Director at the University’s Institute of Law. During this decade he also served as Director of the Latin American Council of Social Sciences and as a visiting professor to the head of the department, William R. Kenan, of Latin American Studies at the University of North Carolina at Chapel Hill in the United States. First associated with the Partido Radical (PR), Lagos later became a member of Salvador Allende’s Partido Socialista de Chile (PSCh), where, as a delegate with the rank of ambassador, he provided diplomatic services during the XXVI General Assembly of the United Nations in 1971. He also served as a delegate in the United Nations’ III Conference on Commerce and Development (UNCTAD) in 1972. Following General Augusto Pinochet Ugarte’s coup d’état in September of 1973, Lagos was forced to move to Argentina and later to the United States, where he resumed his academic activity. In 1975 he worked as a consultant for the Development Program of the United Nations (PNUD) and from 1978, the year of his return to Chile, until 1984 he became an economist for the United Nations’ Regional Employment Program for Latin America and the Caribbean. In 1982 Lagos became a member of the Executive Committee of the PSCh, and from 1983 to 1984 he was President of the Alianza Demócrata (AD), a political force comprised of the majority of democratic parties opposed to General Augusto Pinochet’s regime. In 1984 he headed the Comité de Izquierda pro Elecciones Libres (CIEL) and on December 15th of the same year became one of the founders of the Partido por la Democracia (PPD). The campaign of “no” to the restructuring of Pinochet’s presidency in the plebiscite of October 5th 1988 provided the push that the PPD and Ricardo Lagos needed to become prominent political figures. With Patricio Aylwin as the new President of Chile, Ricardo Lagos became Minister of Education (1992-1993), initiating an educational reform intended to decentralize Chile’s educational system. He was appointed Minister of Public Works (1994-1998) by President Eduardo Frei, and in this position Lagos created an innovative system of road projects involving the participation of the private sector, which invested nearly two billion dollars in different projects. 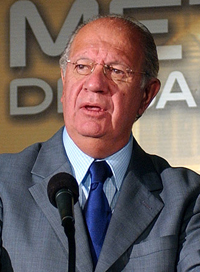 In March of 2000, Ricardo Lagos was elected the new President of Chile. In 2007 he was appointed Special Envoy for Climate Change by UN Secretary-General Ban Ki-moon. Lagos has published the following works: La concentración del poder económico (1971, his doctoral thesis), Chile at the turning point (1979), Hacia la democracia (1987), Después de la transición (1993) and Mi idea de país (1999). He is also a member of the Círculo de Montevideo.